MerCruiser, Volvo Penta/OMC 4.3L - 2 bbl, Intake Manifold. This is a BRAND NEW two barrel intake manifold for Volvo Penta and MerCruiser 4.3L marine engines. Made for 1996 and later 4.3L engines with 8 bolts on the intake manifold (pre-1996 4.3L marine engines have a 12 bolt intake manifold, therefore this intake will only work on 1996 and later 4.3L engines). 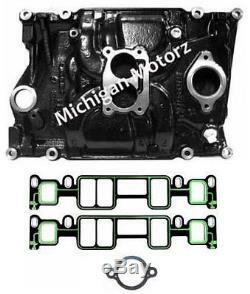 Includes: 4.3L intake manifold gaskets. Volvo Penta #3855807 OMC #3855807 Crusader #7150950. Read our Feedback - We deliver what we advertise! The item "MerCruiser 4.3L, 2 bbl Intake Manifold (1996-Later) withGaskets 824324T02" is in sale since Thursday, April 28, 2016.